Chili con carne is basically a dish of highly seasoned and long-cooked beef with peppers. In some areas, chili is more of a stew, and in other areas, it might include beans. Chili doesn't necessarily have to be served in bowls. Use chili to top hot dogs, pasta, burgers, baked potatoes, and omelets. The crockpot chili recipes below include Texas chili, chicken chili, super easy chili, and more. The slow cooker is an excellent choice for a spicy long-simmered chili. Chili, with its widespread popularity and Texas heritage, is one of America's favorite cold weather dishes. This beef and pinto bean chili is loaded with flavor. Mild chile and jalapeno peppers flavor the chili along with cumin and chili powder. Canned pinto beans and the slow cooker make for an easy preparation. This hearty slow cooker chicken chili is relatively light and low calorie compared to the classic beef or pork chili. Boneless chicken breasts and a variety of canned beans make the chili super easy and convenient. Ground beef and sausage chili is an excellent and classic chili to cook and enjoy all winter long. Serve the chili with freshly baked cornbread or crusty rolls. This chicken chili with jalapeno peppers is made with dried great northern beans, chicken breasts, and vegetables. Zucchini or summer squash make this an excellent chili to make any time of the year. 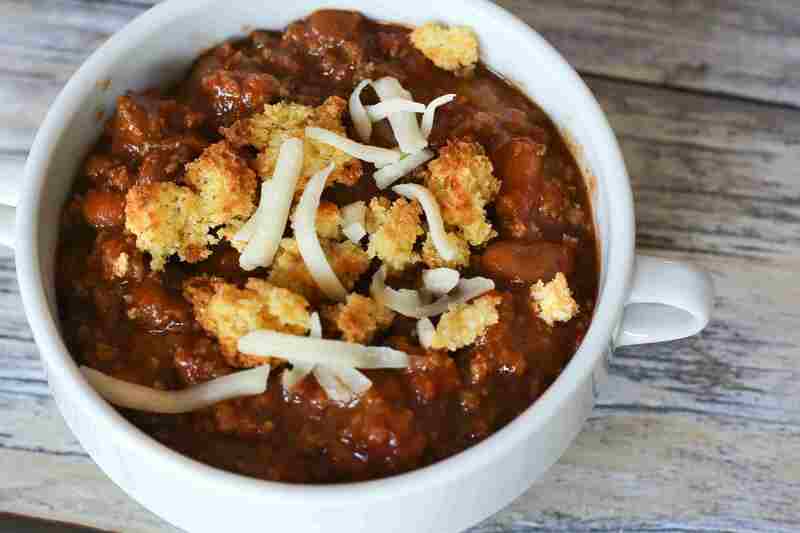 Serve this hearty ground beef and black bean chili with cornbread or crackers. This is a chili your family will ask for again and again. Use a slow cooker or cook it on the stovetop. Beer and New Mexican chile powder flavor this tasty no-bean beer chili. Use lean beef cubes in this recipe. Beef cubes, bacon, and kidney beans go into this comforting Texas beef chili. Diced carrots add a subtle sweetness to the chili. Use pinto beans or small red beans if you prefer. This chicken chili is loaded with flavor. Ingredients include corn, carrots, tomatoes, beans, and peppers. Garnish the chili with sour cream, shredded cheese, or sliced green onions. This easy crockpot chili is seasoned with an envelope of chili seasoning along with chili powder and garlic. Prep time is no more than 15 minutes, and then it cooks hands-free the rest of the day. This well-seasoned game day chili makes a big batch, and it's packed with beef and spices. Feel free to add some jalapeno peppers for a little more kick, or add some beans. Take it along to the game in the slow cooker. This "Skyline Chili" is a Cincinnati classic. The highly seasoned beef and bean chili are served over hot cooked spaghetti with chopped onions and shredded cheese. This all-bean chili is loaded with flavor. Black beans, tomatoes, other beans, and seasonings make it a hearty vegetarian dish. Add a garnish of shredded cheese, sour cream, or chopped hard-boiled eggs. Chunks of chicken are slow cooked to perfection with white beans, peppers, and jalapenos. Serve this chicken chili with shredded cheese and tortilla chips. This chili is made with three kinds of canned beans. Use lima beans, kidney beans, and Great Northern beans, or substitute pinto beans or navy beans for one of the varieties. Ground beef, tomatoes, and chili seasonings make it a hearty, flavorful chili. This chili, from Ness, uses both ground beef and chunks of stew beef, along with beans, tomatoes, and seasonings. The recipe calls for tomato soup with the beans and tomatoes but you could also use a small can of tomato paste and a small can of tomato sauce to replace the condensed soup. This all-beef chili is made with ground beef. You can use coarse or regular ground beef, stewing beef, or a mixture of ground beef and ground pork or bulk sausage. The stewed tomatoes add texture and flavor, but crushed tomatoes, fire-roasted, or chili-seasoned tomatoes would be excellent choices as well. Chicken and chicken sausage are used in this tasty white bean chili along with tomatillo salsa, tomatoes, corn, and peppers. This ground beef chili is a simple preparation. It's made with canned beans and tomatoes. Bell peppers, chopped onions, celery, and chili powder add texture and flavor to this chili. Rick's chili is a perfectly seasoned mixture of extra lean ground beef, beans, and tomatoes. Tabasco sauce and ripe olives add heat and flavor. Hot chili beans and kidney beans make this a hearty and delicious beef chili. This is a classic white chili made with chicken and great northern beans. Top the chili with shredded cheese, or sour cream and salsa. This is another classic chili with ground beef. Kidney beans, tomatoes, and seasonings make it a satisfying stick-to-your-ribs chili. Serve this classic chili with shredded cheese and serve it with Tex-Mex cornbread and coleslaw. Your family will love this satisfying beef and bean chili. Baked beans add unexpected flavor to this chili. This is a Cincinnati-style chili made with a variety of spices, including cinnamon and allspice. The chili is traditionally served with spaghetti. Taco seasoning flavors this easy ground beef and bean chili. The taco chili is perfect for game day parties, tailgating, potluck dinners—you name it! Garnish the chili with tortilla chips. Zucchini and corn add flavor and texture to this easy white chicken chili recipe. Here's a great idea for using that leftover chili. Bake the chili in muffin cups lined with biscuits! Great northern beans, cilantro, and corn are featured in this tasty slow cooker white chicken chili. It's made with chicken thighs. This chili recipe is made from scratch with dried pinto beans or small red beans. You could also use kidney beans or great northern beans if you prefer them. This Coney Island chili mixture is the perfect topping for hot dogs. Take it to a tailgating event and serve it from the slow cooker.